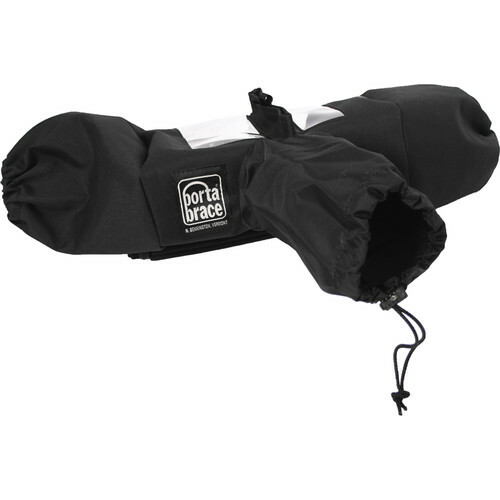 Safely use your Sony Alpha a9 camera in inclement weather with this Rain Cover from Porta Brace. Made of triple-layer nylon with a Fabuthane waterproof coating, this protective cover helps ensure your camera (and your hands) stay dry while allowing full access to the controls via its two elastic openings. It can be used to shield your gear from elements such as rain, snow, dust, and mud. Clear vinyl windows provide an easy way to check your settings and display while shooting. Also around the top area is a double-layer access panel, which can be opened or closed via touch fasteners. This enables you to attach a flash or another accessory onto the camera's hot shoe while using the waterproof cover. Box Dimensions (LxWxH) 13.6 x 9.5 x 9.3"
Rain Cover for Sony Alpha a9 (Black) is rated 5.0 out of 5 by 2.
will this fit a9 with 100-400 GM lens? Yes, the Porta Brace Rain Cover for Sony Alpha a9 may be used with the Sony Alpha a9 Mirrorless Digital Camera and the Sony FE 100-400mm f/4.5-5.6 GM OSS Lens. will this fits sony alpha 7R mark II? will this fit a9 with soon-to-be-released 400 2.8 GM lens? Asked by: Newell B. E.